We had breakfast at 8:00. A plate of waffles with bananas and blueberry's served with a pot of whipped cream on the side which we did not eat. We drove into town and hired 3 mountain bikes from McBike and Sport. The staff were very friendly and the bikes were excellent value at $33.80 per bike for the day. Louise rejected the saddle and opted for a more padded saddle at $30 which she had to buy. Our pedals were fitted for no charge. My bike was brand new and was taken from the row of bikes that were for sale outside the shop.. It even had the price tag still on it. 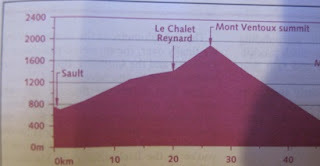 The shop suggested a route that they described as mainly flat. It did not fit Louise's definition of a ride without hills. We followed the 16 out of town and turned off on Tallow Road towards Telkwa. HB The road started as paved up after a couple of miles changed to gravel. The road started by following the course of the river but had a few unexpected hills. Just outside Telkwa we had to cross the Telkwa River. The crossing turned out to be a footpath on the side of the railway line. 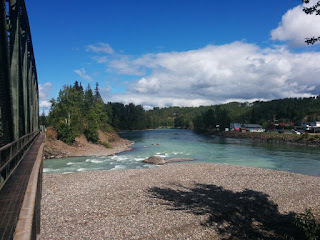 We the crossed the Bulkley river by the road bridge to enter town and located the bakery that had been recommended to us by the bike shop.. The Telkwa Baeckerei Kaffeehaus had a fine selection of bread and cakes and we plan to stop again in the car tomorrow to buy provisions for lunch. Lyn and I ordered a small pizza and sandwich to share. This was a mistake as the sandwich was huge and would have fed both of us. Half was packed up for later. After lunch we called in the local museum next door. Admission was by donation with the entrance fee going towards supporting the museum and church opposite. They had a varied collection of artifacts including a a machine for reeling up fire hoses to allow them to dry and horse snow shoes. We even had a tour of the church opposite after Louise asked if we could see it. We were too full for an ice cream so continued for a couple of miles down the 16 and turned off on Tyhee Lake Road. The road climbed around the lake and when we had got past the trees had splendid views of the lake and glacier and mountains. 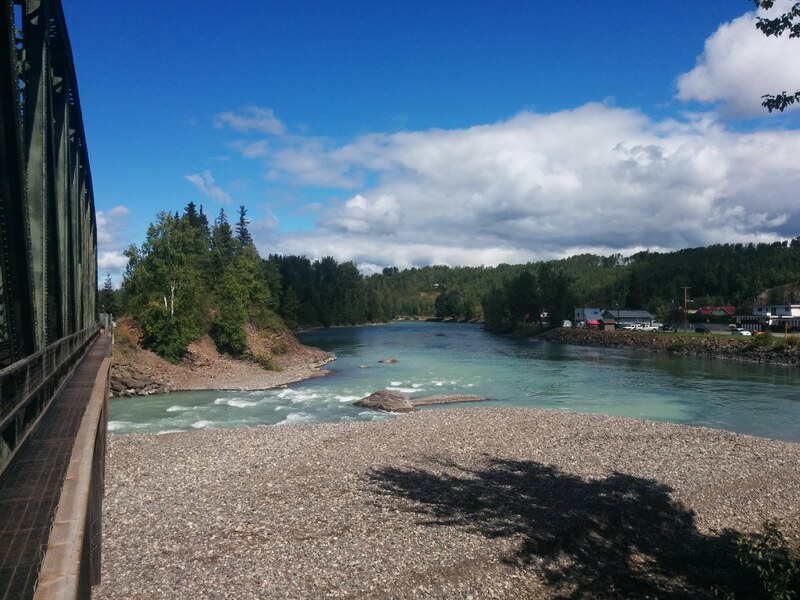 We returned via Babine Lake Road to the 16. Louise spotted a bus on the main road but it was going in the wrong direction. Fortunately the 3 miles to the outskirts of Smithers were mostly down hill. We arrived back at the bike shop just before 5:00. Louise handed her bike in and we went for a drink and well deserved frozen fruit yogurt at a nearby cafe. The round trip was about 23 miles. No wonder Louise needed a 4 sugar cup of tea to recover. 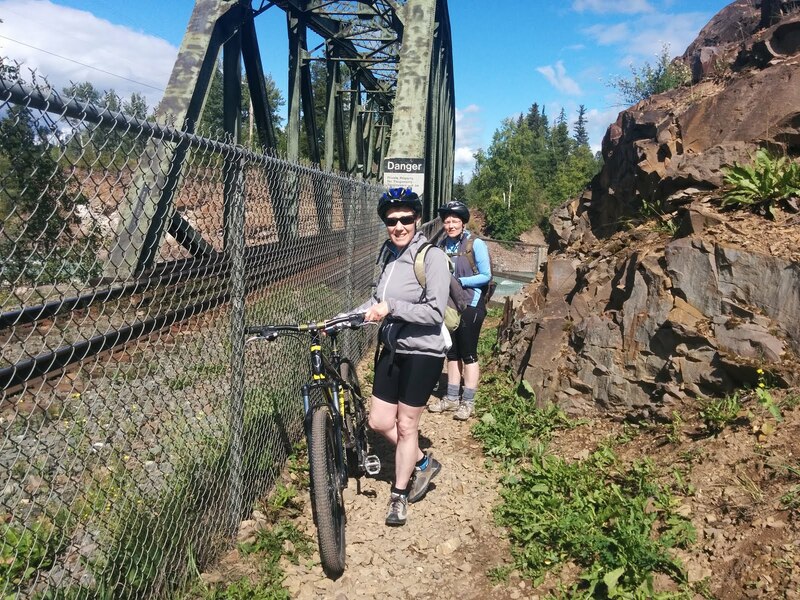 Whilst Louise wrote postcards Lyn and I cycled the perimeter trail around the town. The trail was marked but did have the occasional missing sign and a section that was closed. We returned to the car at around 6:45 and after a long struggle to get one of my pedals off we decided to eat in the Aspen River House for a second night. Returning to the B+B after our meal for tea and cake. Well done Louise! We are impressed.